and that’s all there’s to it. Nice! Dvorak for the win! I actually use Dvorak, but my keyboard can switch and send the corresponding Qwerty key when I press the Dvorak key, which is quite convenient, specially when there are other keyboards connected to the same computer being used by other people. It’s the Kinesis Advantage, the “Advantage Qwerty/Dvorak Switchable, USB, Black. Contoured Keyboard for Mac & PC, KB500USB/QD-blk” comes with dual key-caps, both qwerty and dvorak, although I think you can switch any of them to dvorak as the software is the same. It is an expensive keyboard, but if you really value your hands and spend a lot of time in a keyboard, I believe it’s the best one to have. If you ever are stuck with Windows, I reckon AutoHotkey (installed with the Unicode setting) would be the way to go. Dankon por via blogero! Mi estis serĉanta solvon sen bezono instali ion ajn! Fine, iu klarigis la simpla metodo por usi la specialajn literojn en la lingvo sur la Macintoŝ computilo. Me tre dankas vin pro via helpon. 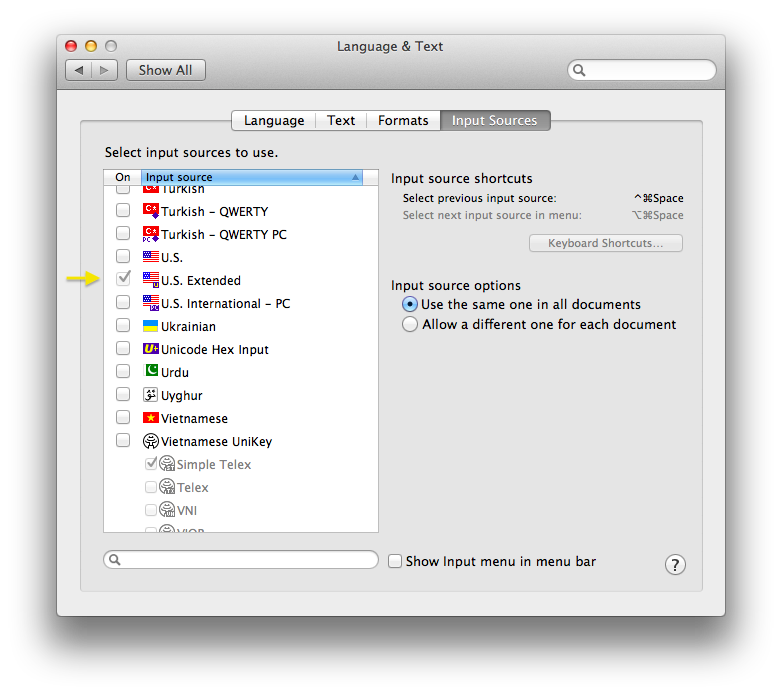 I have Mac OS 10.13.3 (High Sierra) – There is no “English Extended” – I tried ABC extended but these instructions do not work. Thanks. Yeah. This article is very old. I’m not sure what the current situation is.